A woman’s purse may seem like a bag of mysteries to a lot of people! Men and children tend to think that we carry a solution to most of life’s problems. Shirt stains, headaches, bad breath, dirty hands, messy hair, heartburn, dry skin, hunger pains, uncharged phone, etc. – we supposedly have solutions to all these issues in a little bag hanging over our shoulder! The thing is – we kinda’ do! However, have you ever been out on the town and discovered that you didn’t have an item you really needed! Below is a list of the essential items every woman needs for a well-packed purse. If you are anything like me, you tend to get blisters! are a life-saver! If you or a friend gets a cut or scrap, these little guys can come to the rescue! I always carry some spare makeup in the inside pocket of my purse. Makeup wears off during the day and having a little mid-afternoon touch-up can keep you looking fresh! I always carry a small tube of mascara, concealer, eyeliner, and several shades of lipstick! Lipstick can also double as a blush if your cheeks are looking pale. Does your deodorant tend to wear off every 3-4 hours, leaving you with the tendency to smell like a freshly peeled onion? Or maybe you’ve had a busy day and those armpit stains are starting to show up. A can rescue you form many smelly and sweaty situations. If you want to stay away from the cold and flu, is nonnegotiable! Riding public transit, shaking hands with customers, or simply touching a germ-covered door handle can spread sickness to you and your family. Always have a small bottle of hand sanitizer in your purse to fend off sickness! save the day! If you are anything like me, your hair tends to get tangled within minutes of brushing it. I reach into my purse and give a quick comb-through to get my hairstyle back to normal! In case you didn’t know, I am very serious about my personal safety – every woman should be! Read “20 Personal Safety Tips Every Woman Needs to Know”. In a case of emergency or danger, these little alarms can bring attention to you and your location very quickly. I always keep mine in the outer pocket of my purse, ready to pull if I feel that I am in any danger. A small has many purposes. Allergies, cold, wet armpits, tears, spilled beverages, napkins, or a coffee coaster substitute…this little piece of recycled fiber can come in handy! Since the beginning of time, us women have needed a “looking glass” to inspect themselves in! Need to apply some makeup or check your teeth after eating? Get out your handy little and touch yourself up! Whether your skirt, blouse, or necklace has a malfunction, a safety pin is always there to rescue you! I cannot tell you how many times my hem has come undone or a button has popped off my shirt leaving me with an embarrassing wardrobe malfunction. When these times come, you will be grateful to have a hanging out in your purse! Even if you don’t own a business or don’t really need a business card, they really do come in handy and make you look very prepared and professional! Design a business card with your name and number on it. When necessary, pass it out to acquaintances or colleagues. 12.) Tampons – several of them! I cannot tell you how many times I have saved myself or a friend from an embarrassing mishap by having a tampon in my purse! Mother Nature loves to spring the “crimson tide” on us at random, unexpected moments, so it is always wise to have a tampon on hand for these occasions! This is one of the most important things in my purse! Since I have chronic headaches, having Tylenol or Ibuprofen in my purse is a must! It is also nice to help a friend out when you see them struggling with some pain. Also, pack an anti-acid if you or a family member suffers from heart-burn. They can be life-savers when you are going out to eat or travelling long distance. Oh those nasty hang nails! A is a major necessity, especially if you have a hang nail or the urge to unnecessarily bite a nail. Also, if you are bored, you can always give yourself an impromptu manicure! Pro Tip: A metal nail file can also be used as a self-defense weapon. Multi-purpose is the key! Be honest with me – do you love a messy bun as much as I do? When I am tired of having my hair in my face, up it goes into the easiest hairstyle women have ever known! A can also come in handy as a stylish bracelet – just kidding! I cannot tell you how many times I have regretted not packing my . Just today I wanted to go for an impromptu walk downtown, but I forgot my headphones! Have a spare pare of headphones that you only keep in your purse. They will come in handy during long wait-times, travel, or exercise. This one may be common, but it is oh-so necessary! Do you have bad morning breath even after you brush your teeth? Does your lunch make your breath smell like an onion farm? Are you going into a meeting and need to look and smell your best? A small is the key! No one likes to have their phone battery die while they are out! Spend a few extra dollars and buy a phone charger to carry in your purse. Whether you are out shopping, travelling, or visiting a friend, it is always a good idea to have your phone fully charged in case you really need it! Come on – we all get “hangry”, right! For those moments when our blood sugar drops or we feel the tummy rumbles coming, it is always smart to have a little snack handy. I like to keep a little packet of or a in my purse at all times. Helps to keep my energy up and combat embarrassing stomach sounds in business meetings. Sunglasses are not only stylish, but they are actually very important for eye-health! Always have a pair of sunglasses in your purse to help combat sun damage and help you stay safe from sun-glare while driving during the day. Also, buy a for them – they aren’t expensive! I’m a grown adult, but I use all the time! I’m telling you, I am a spiller! These wipes clean up messes in my car, off of me, and off my hands and face. These items are all necessary and very inexpensive! As a girl, I LOVE to be prepared for any situation that is thrown my way. 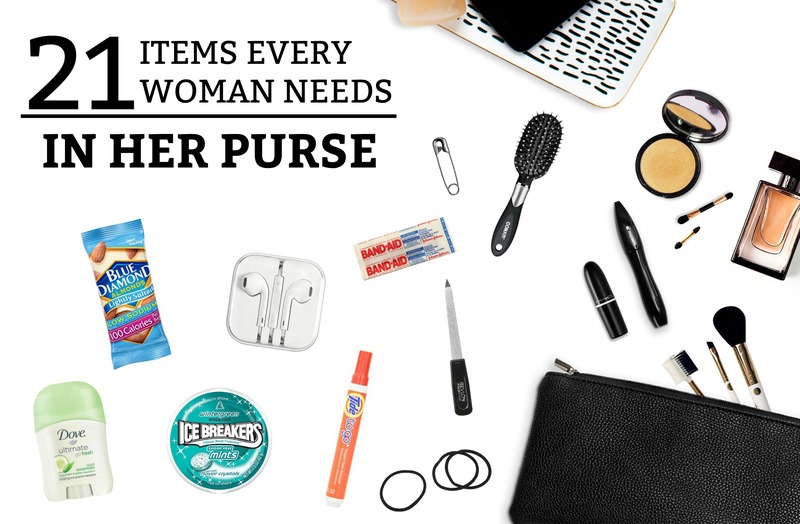 Although it is rather heavy, my purse is full of little problem-solvers – and I wouldn’t have It any other way! What about you? What items do you carry in your purse at all times?